A frozen hot chocolate cheesecake (ice cream, chesesecake-flavored pie) with an oreo crust, mini marshmallows, and swirls of marshmallows mixed throughout. Do you remember my frozen pumpkin pie cheesecake? It has (so far) been the most popular recipe on the blog. And definitely one of my favorite desserts. Even my husband (not a pumpkin fan) ate his fair share of that pie. That’s when you know you have a recipe win btw. Well, I have great news! I went at it again, and created another version of that pie. This one is more December and Christmas appropriate though – it’s hot chocolate flavored! 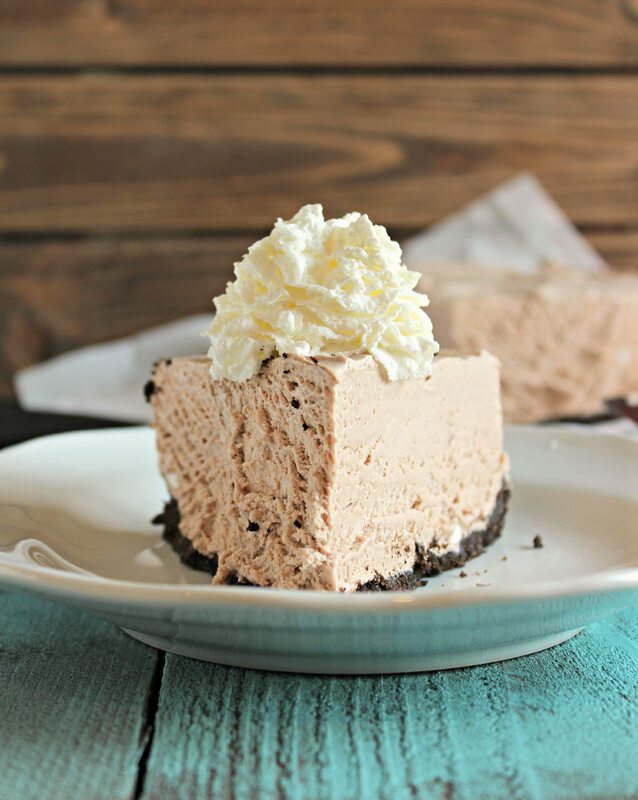 With tiny marshmallows and marshmallow ribbons throughout; this frozen hot chocolate cheesecake is sure to be a hit! And then there’s the crust. (I’m going a little backwards talking about the filling first and the crust last.) The crust is oreos with some sugar and butter. Um, yes. It’s delicious. The oreo crumbs and sugar are mixed with some butter and pressed into the pan and you have an easy thick chocolate crust. This pie is a frozen pie. The consistency is ice cream-like and the pie will need to remain in the freezer. That is, if you have any leftovers…. In a food processor, process the Oreos until they are crumbs and pour those crumbs into a medium sized bowl. Melt the butter and mix with Oreo crumbs and sugar. Stir until a sticky dough is formed and then press the Oreo dough into the bottom of a springform pan. Press the crumbs throughout the bottom of the pan and a little up the sides. In the same bowl (less dishes!) you used to make the crust, put in the cream cheese. Using hand mixers, mix the cream cheese for about 30 seconds to 1 minute. Slowly add in the sweetened condensed milk and continue to mix with the hand mixers for about 3-4 minutes. Using a spatula scrape down the sides and continue to mix for another minute. Turn off the mixers and pour in one packet of hot chocolate. Stir the hot chocolate until incorporated and then add in the next packet. Repeat this step until all six hot chocolate packets are incorporated in the mixture. With the spatula, fold in the cool whip until it is completely incorporated. Be careful to not over-mix the cool whip with the rest of the ingredients. Then mix in the marshmallow fluff so it swirls around with the rest of the ingredients. Barely mix in the fluff so there are marshmallow ribbons throughout the pie. Pour the mixture into the pan on top of the Oreo crust. Freeze overnight or for at least 8 hours. Thaw for about 10 minutes before serving and return any leftovers to the freezer after served. Looks amazing Chelsea!!! It makes me think of that frozen hot chocolate everyone always talks about from Serendipity in NY! I see this cheesecake happening in my future. How can you go wrong with a hot chocolate inspired cake? Thank you for sharing! This is delicious! Love that you used cocoa mix with marshmallows in this. What a fun idea. Looks tasty, Chelsea. Your blog title always makes me giggle whenever I visit. Keep those yummy treats coming! Whoa, now this is a cheesecake! 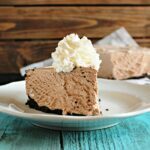 I’ve always wanted to try a frozen hot chocolate but in pie form? Even better! I can never turn down an oreo crust! 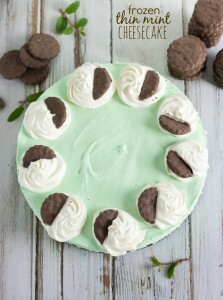 I HAVE to make this cheesecake!!! Totally making my tummy rumble. Thanks so much for sharing at Simple Supper Tuesday, this week. 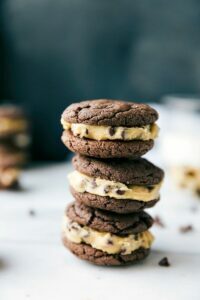 Saw this recipe on the Tuesday Talent Show link share and had to check it out! Looks fabulous!!! 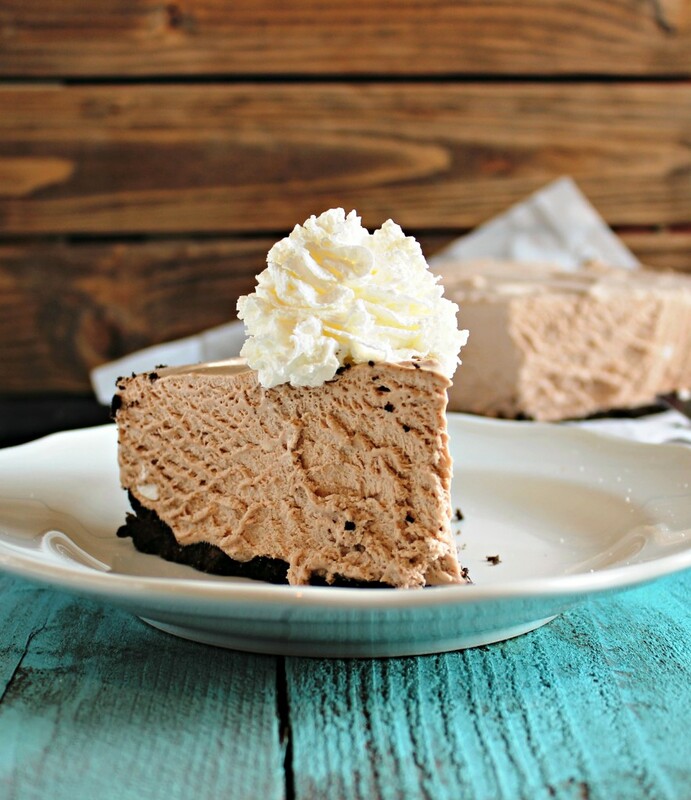 Hot chocolate in a cheesecake sounds yummy! Thanks for sharing. Yum! This looks absolutely fabulous!! Hot chocolate in a cheesecake?!! Seriously? You’re genius! Great recipe! Are you allowed to spell “marshmallows” with an “e”? Haha I totally agree! I’ve done a few baked cheesecakes and they are always way more stressful than the frozen ones 🙂 Thanks Beth! Using hot chocolate mix with the mini marshmallows already inside is a great idea! This looks super tasty. Ohhhhhhh this looks divine!!!!! What a delicious looking dessert! Was thinking of making this and adding a hint of peppermint for a chocolate candycane taste. What do you think? I think that would be delicious! I haven’t tried it but think I will next time 🙂 great idea! I’m excited about this pie too, Chelsea! It looks unbelievably delicious!!! Hi there. This looks delicious! I want to try it over the holidays. I’m thinking of making peppermint whipped cream to go with. I was just wondering what size of pan you used. Thanks! Thanks Nathan! You’ll have to let me know how the peppermint whipped great goes with it, that sounds delicious! I used a 9 inch springform pan. I can’t wait to make this for church group on tuesday!!! For the crust, do you use whole Oreos or just the cookie pieces, not the cream center..?? Ok awesome, that makes it much easier! 😛 Can’t wait to try it! I am not able to find the mix, with mini marshmallows here in Aussie, we have the mini marshmallows readily available in shops, so my question is do you have an approximate quantity, by weight, of hot choc mix and marshmallows used? One packet is 28 g about 45 mL (3 Tbsp). I just opened one up! I was curious about the same comment, but I am assuming that the mini marshmallows that we find in the store (I’m in Canada) are going to be bigger in throughout the recipe and hopefully won’t make too big of a difference. I wanted to find out because I just want to use the big cans of powder, so I just figured out (while doing your math) that I’ll need a heaping cup of hot chocolate powder (needs 18 Tbsp, 16 Tbsp. is 1 cup) Hope that helps! Im confused about the hot chocolate mix….did you use Swiss Miss or something like it? I decided to try this recipe finally after seeing it on Facebook months ago and it is by far one of my favorites that I’ve ever made. My husband and son agree too as we are all eating a piece now!! I can’t wait to try more of your recipes! Thank you for this beyond amazing cake!! Hi 🙂 could you substitute freshly whipped cream for the can of Cool Whip? Great recipe! I’m going to make this for my coworkers but was wondering of I could use chocolate graham crackers instead of oreos for the crust? If so, how many do you think I’d need? Thanks in advance! Yes I think that would be delicious! 🙂 I’d say you’d probably need two sleeves of the graham crackers (crush to a fine powder) and about 6 tablespoons butter. I made this for my Valentine’s dinner party and everyone loved it! It was so creamy and flavorful! Thanks for posting, I will add this to my routine of desserts I make! Best dessert hands down. Thanks for the recipe!!! Can’t wait to make it again! It came out perfect!? Wow!! What a compliment! So happy to hear that! Thank you Laura! This looks amazing!!! You’re instructions are great – I just have limited experience with springform pans and found out they come in different sizes. Do you know what size you use for this recipe? Thanks so much! Thank you so much Kelly! I appreciate that 🙂 Honestly any size will work for this recipe so it just depends if you want a taller or thinner cheesecake (taller, use a smaller springform and thinner, use a wider sprinform). Is there are reason why you recommend a hand mixer and not a stand mixer? I this looks so yummy I can’t wait to try! What brand of hot chocolate do you use? I can’t seem to find anything here in Australia thag has marshmallows in it? Thank you so much Tracey! If you can’t find the marshmallow packets you can use regular packets and add dehydrated marshmallows if you are able to find those. I generally use Swiss Miss in this because they have the marshmallow hot chocolate packets! What do you mean by 6 milk chocolate flavored hot cocoa mixes with marshmallows? Could I use a 9×13 pan?? Or does it have to be spring form?? Would it be enough mixture for a ,9×13?? Thanks!!!? Did you freeze it? And are you sure you used the right ingredients? Sweetened condensed milk not evaporated milk and cool whip? It shouldn’t be anything like a gooey pudding. I made this recipe last Thanksgiving and it was a big hit! Made one last night for this year. Thanks for your wonderful recipes!! Yes of course! 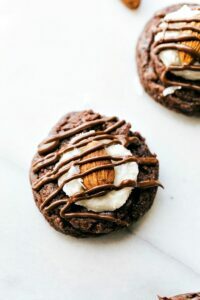 🙂 The filling might be too much for a standard size oreo crust, so you may want to do 2. I’m so sorry Susan! I just switched to a new kind of recipe box and it changed the formatting on some of the recipes; it was supposed to read 22 oreos or about 2 cups. I’ve updated it now. Thank you! Wait! 22 cups of oreos???????????????? I’m so sorry Pixie! I just switched to a new kind of recipe box and it changed the formatting on some of the recipes; it was supposed to read 22 oreos or about 2 cups. I’ve updated it now. Thank you! Can you use homemade whipped cream instead of the coolwhip? I couldn’t get this recipe to set firmly. Perhaps the sweetened condensed milk or marshmallow fluff was too much sugar to allow it to freeze? What are your thoughts? Hey! A couple thoughts; did you use any low fat versions (low fat cream cheese or a reduced fat sweetened condensed milk or fat free whipped topping)? And did you for sure use sweetened condensed milk (I’ve had a few people confuse it for evaporated milk which are right next to each other!) Let me know; I’d love to troubleshoot with you on this recipe!